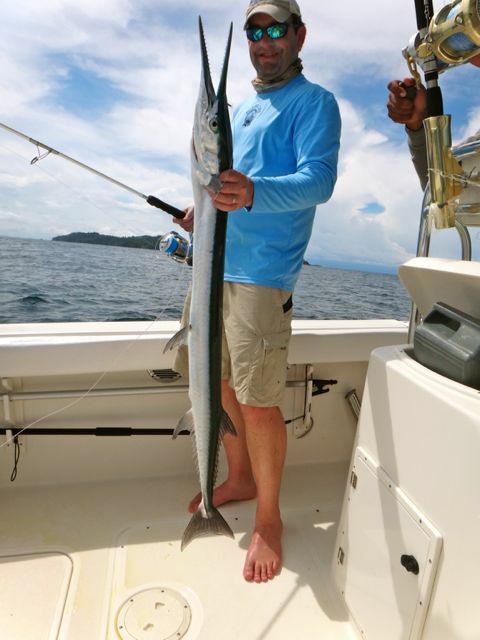 Come Fish Panama welcomed David and Jessica for 1 day of offshore fishing. After experiencing a flight cancellation that delayed their arrival by 1 day, we finally were able to head offshore with great anticipation. Our weather continues to surprise us with unseasonable conditions, but we’re not complaining one bit. Occasional heavy cloud cover keeps things cool and the water color is about as perfect as you can ask for. On this trip, we encountered blue water almost from the time we left the dock. to Hannibal Bank in search of a Marlin or Cow Tuna. Once there we tossed out 3 rigged baits and the waiting game began. 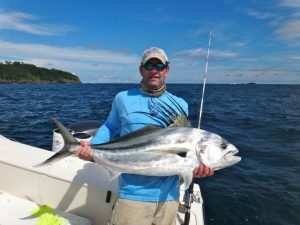 Our plan was to fish Hannibal half day, then search for a Roosterfish around Isla Secas in the afternoon. Around 11 or so, we finally had a hit, and one of the reels started to scream as a large fish took off with the bait. I decide to give it a longer count than usual before engaging the drag to “strike”. Jose shoved the throttles forward for about 5 or 6 seconds then throttled back. David was on! David had slipped into the harness and was ready to go. 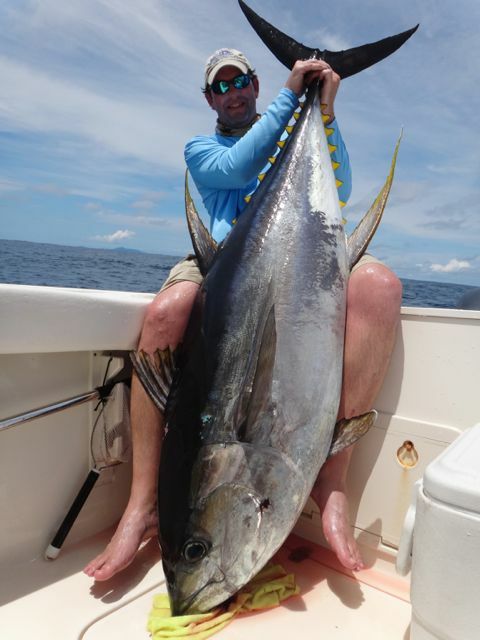 After making short work of landing this Cow Tuna, hi fives were handed out as David sat in amazement of what he had just landed. Both he and his lovely wife Jessica were all smiles, so we quickly took a few photos and by then it was time to move on to Roosterfish. David hooking up with Roosterfish!! many small Dorado around the log, but we decided to leave them in search of David’s Roosterfish. Once at Isla Secas, we slow trolled live Blue Runners while enjoying the beautiful scenery. I am so grateful and blessed for having the opportunity to experience this natural beauty on a daily basis while enjoying the company of our clients. After 30 minutes, we managed a Pacific Needlefish, but that wasn’t the fight David was after. We picked up and ran to a different spot, and after only 10 minutes of dropping our baits, we found Mr. Rooster. This fish gave David a few good runs and an enjoyable fight on spinning gear. We landed the Roosterfish for some pictures and made a live release. 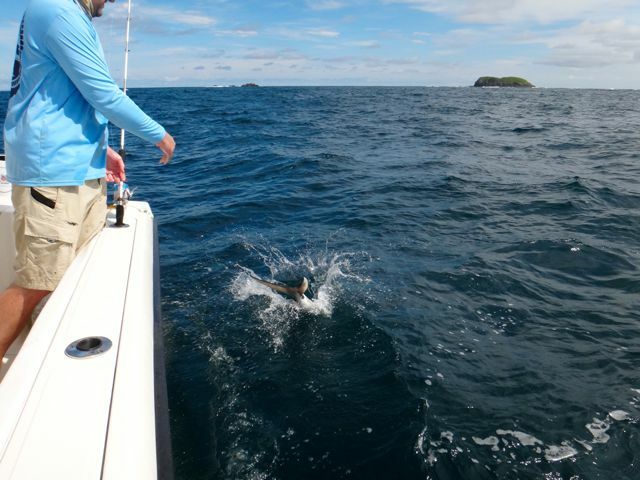 We would like to thank David and Jessica for giving Come Fish Panama the opportunity to take them offshore sport fishing. We wish them well and hope that we have the pleasure of their company on a future charter.